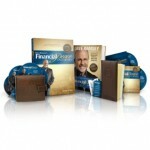 $99 For Dave Ramsey's Financial Peace University with Free Shipping Through 12/18 | A Savings WOW! Many people’s New Year’s resolutions is to save more money throughout the year or to learn how to manage their money better. Dave Ramsey offers many different options that help you do just that. One of his most popular classes is the Financial Peace University. The Financial Peace University Lifetime Membership is available through December 18th for only $99 and includes on-location classes, a workbook, CDs of the lessons, and access to members-only resources. It’s a great way to get started and take control of your finances! You can also check out the other items available for free shipping – many of them make great holiday gifts for all ages! Check out Dave Ramsey’s Financial Peace University Lifetime Membership with free shipping!